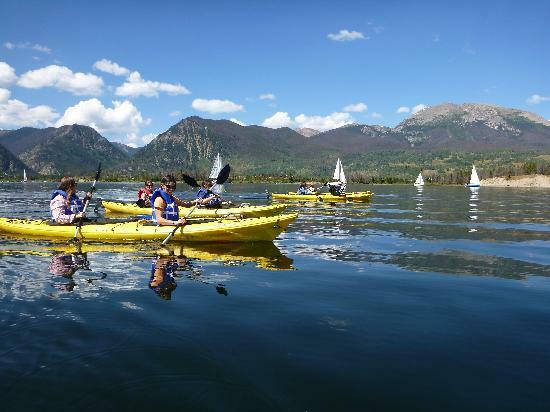 We are Summit County's one and only Sea Kayak Tour operator on Dillon Reservoir. We specialize in family friendly nature tours out of our super sturdy and comfortable tandem sea kayaks. We are Summit County's one and only premier Sea Kayak tour company. Going on our sixth year specializing in family oriented guided trips on Dillon Reservoir. Trips range anywhere from the 1.5 hour family tour to full day private excursions putting in and taking out at the Frisco Bay Marina right off Main Street in Frisco, Colorado. Our professional guide staff is trained in kayak safety, instruction and the occasional story telling. We pride ourselves in our commitment and dedication to our environment and believe the only way to live is outside! So please join us at the "office" we call a kayak and experience Summit County like so few ever have before.